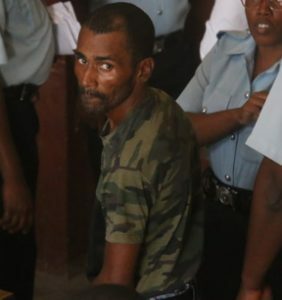 A clothes vendor who admitted to removing a phone that was in a chair at the Georgetown Public Hospital was yesterday released on $100,000 bail pending sentencing. Shawn Smith, 42, of 68 Dennis Street, Campbellville , pleaded guilty. He sought to explain his actions that led to the charge which stated that on January 7, last, at New Market Street, Georgetown, he stole one cellular phone valued $100,000, property of Cathleen Bristol. Police Prosecutor Adoni Inniss told the court that the victim, who is a midwife at the Georgetown Public Hospital, was in the nurses’ room taking a rest. The court heard that when the woman woke up she discovered her phone was missing and she immediately alerted her colleagues and the security guards. While searching for the phone she was informed that a male was in the room. She then related the information to the guards. The guards then made checks around the hospital and they saw Smith sitting on a bench. A search was carried out on him and the phone was found in his pants pocket. The matter was reported to the police and Smith was later arrested and taken into custody. Smith went on to tell the court that 15 minutes after he picked up the phone he was confronted by police officers and he willingly handed over the phone. Prosecutor Inniss told the court that Smith was previously convicted for an offence and has a pending wounding matter. However, Smith denied ever been to prison and having a pending matter in court. Based on what Smith told the Magistrate, she instructed the Prosecutor to find out the date when he was sentenced and for what offence. The Magistrate released Smith on $100,000 bail pending sentencing on January 15.